Cookie Dough Ritz Crackers are a delightful combination of Ritz crackers, cookie dough, and chocolate. Cookie dough is always a good thing. So are Ritz Crackers. When you put them together and dip them in chocolate? If you’re like me you’re probably running around like a crazy headless chicken, trying to get everything done before Christmas. You with me? 4 weeks between Thanksgiving and Santa is just not enough time. Christmas is in less than 4 days and in that time frame I need to make about 4 more recipes, finish wrapping gifts, go grocery shopping (twice), and clean my house. I thought it was supposed to be vacation? Oh wait, that’s what the husbands and the kids get. If you need a last minute treat that will literally take you no time at all, you’re in the right place. Cookie Dough Ritz Crackers are going to be your BFF. Like I said, these Cookie Dough Ritz Crackers come together in minutes. I simply made a smaller batch of my favorite cookie dough and I left out the eggs and the leavening. The result is a buttery, brown sugary, chocolaty cookie dough that you’ll be addicted to eating. But wait, I’m not done. Take two Ritz crackers and make a cookie dough sandwich. Then dip the sandwiches in chocolate. Easy, right? A great gift for anyone…or yourself. If you’re feeling lazy, like I was that day, you can drizzle some of the sandwiches with chocolate instead of dipping. (Remember, I have a handy tutorial for dipping candies without tears!) 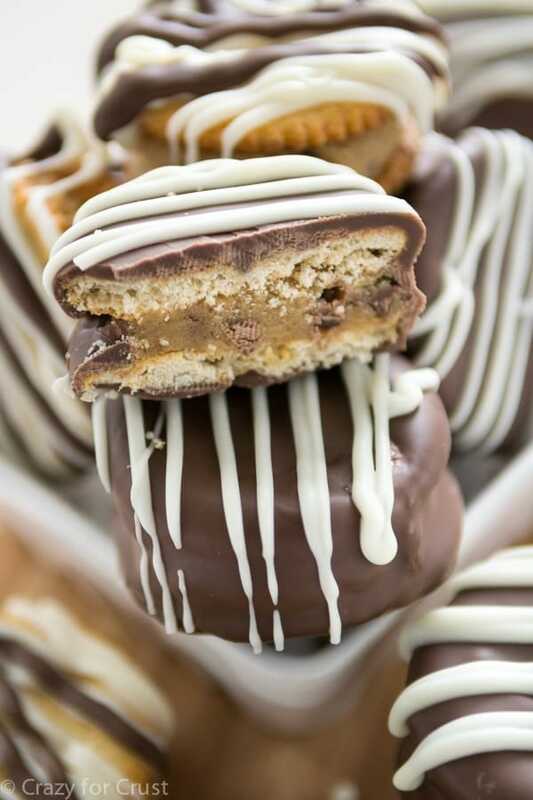 Or, if you’re really not into melting chocolate, get yourself some of those chocolate covered Ritz and just sandwich the cookie dough with that. The crunchy salty crackers pair really well with the sweet cookie dough. 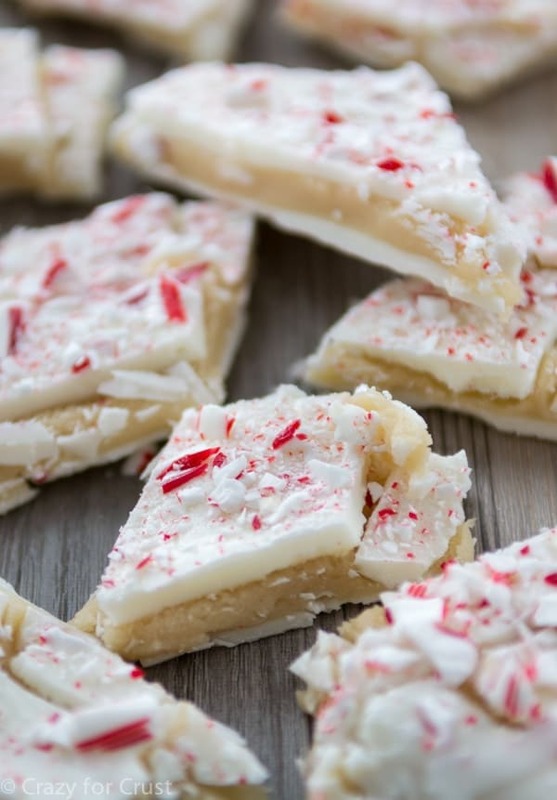 These are the perfect gift and the perfect last minute party dessert. I dare you to eat just one of these Cookie Dough Ritz Crackers. 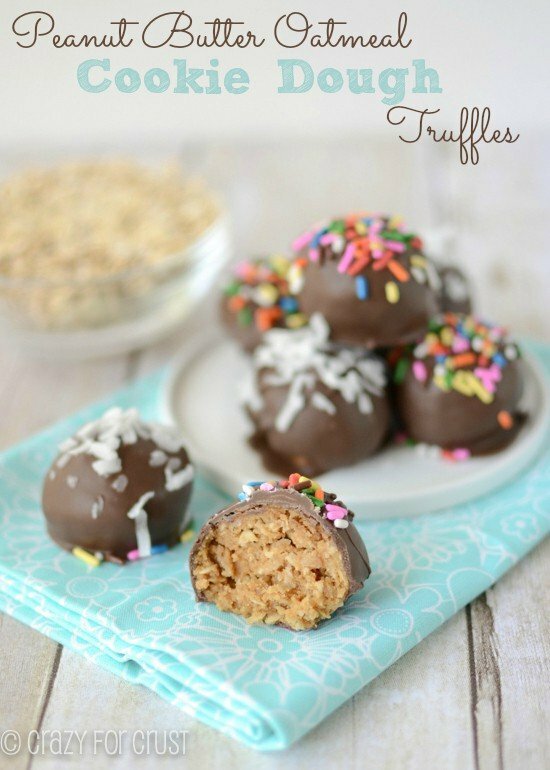 Easy with just a few ingredients, these are done in such a short amount of time! 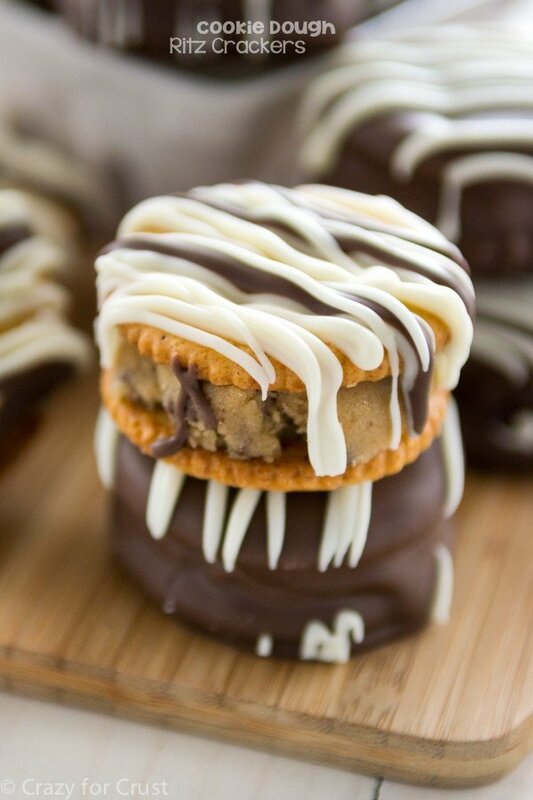 Eggless chocolate chip cookie dough is sandwiched between two Ritz crackers and dipped in chocolate. The perfect gift! Is it possible to freeze these once made? If you totally cover them in chocolate, yes. If not, I would err on the side of no, so that the crackers don’t get soft. You can make the cookie dough ahead of time, even scoop the balls and freeze those, then assemble them when you need them! Do you know what I could make with white chocolate , peanut butter , ritz crackers , and pineapples? I only have salted butter. Would it be fine to use the salted butter if I omit the 1/8 tsp of additional salt? 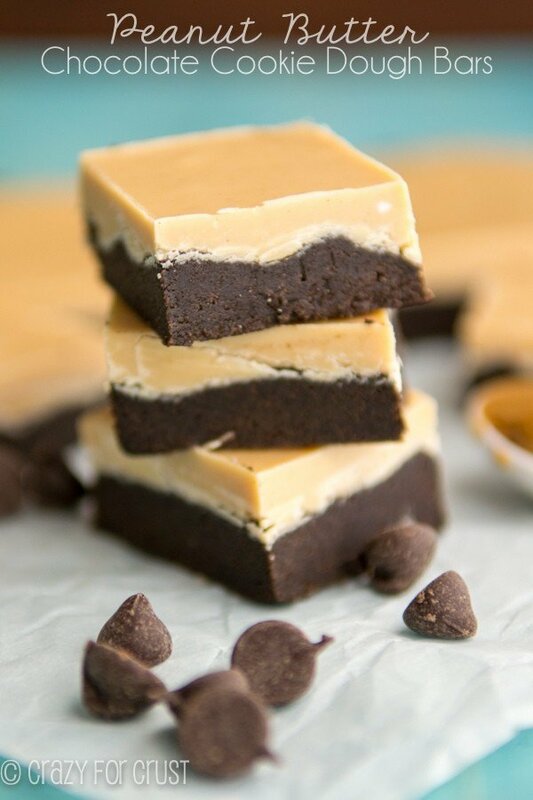 🙂 I want to make them tonight and can’t go to the store! Please bake the flour first! Raw flour is not safe to eat.